A guide for the best restaurants and eateries in Tel Aviv. Created by two eat out lovers who would like to share their culinary experiences. Eating a sabbich might seem very uncharming, because it's thick pita bread heavily stuffed with delicious vegetables and condiments. You might have thought that it would be easier to eat the ingredients on a plate. Well, Sabbich Deluxe is exactly the place to be then, as they in an unprecedented way gives you the option to eat the sabbich on a plate. Not only that, you can also add add rice and some other stuff. Oh, and the taste is great! (even if you eat it in a pita). 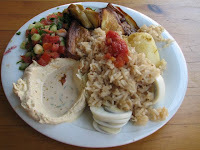 Imagine that you stuff all of this in a pita and try to eat it, now that is a mouthful! Besides the sabbich on plate, they also serve great sandwiches with chicken schnitzel or grilled beef or vegetarian sandwiches. They have bar-like seats outside, but note that these seats are always taken during lunch hours. It's a very popular place for people working in the area and having lunch there. 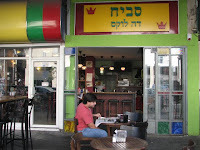 Iben Gvirol 67 - It's on the intersection with Rabin square. If you come from north, go stright on Iben Gvirol and cross the square. You'll hit the place after couple of meters.